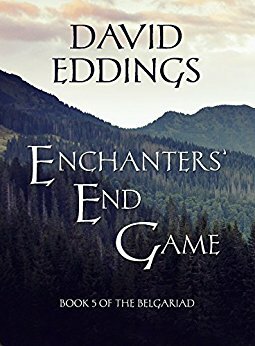 Enchanter's End Game: 310 pgs. Well, this took a few days longer to finish than I thought it would.. but that's 'cause I got sick. So sick I didn't want to read. It had something to do with my whole head hurting and being nauseous.. but enough of that... the headache was gone today and I finished the last of the Belgaraid. 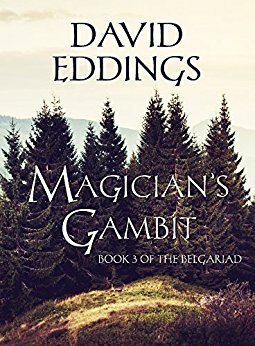 Enchanters' End Game brings about the climax to Garion's long quest to fulfill the Prophecy. Of course, the question is "which Prophecy"? All along the Mrin Codex has talked about two prophecies, and until it happens no one really knows which one it will be. After Garion, Belgarath and Silk had taken off (sneaked out) to go and fulfill the prophecy with the God Torak, and after Polgara has the biggest hissy-fit anyone could possibly have, she and Ce'Nedra get down to business of trying to make a diversion for Garion in the form of a war. Ce'Nedra (finally realizing she loves Garion) rallies the biggest Army possible as they move towards their goal of helping Garion, so that he might get to Torak before he wakens. What actually happens when they meet Torak is for you to find out when you read the books. It is the ultimate group of endings to many things in this series. You don't realize how many things would be left "unfinished" had Mr Eddings not taken his time in making the ending as he did. ... as I said earlier.. I had a few moments of tears, even though this is not the first time I've read these books. The Belgaraid is one of a handful of series that I reread every so often.. and I'm happy to say.. they never disappoint. 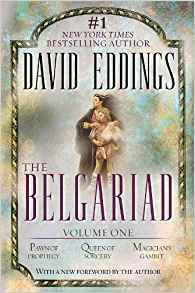 Eddings has written other series, that, although they are good, they don't hold a candle to The Belgaraid. If in your reading, you are character driven, and like fast moving adventure... this set of books is one I'd suggest you try! They surely rank up there with a half dozen or so of my absolute favorites! The Castle of Wizardy: 326 pages. I can't possibly say enough about this series of books. But you have to love when you have a book (or in this case bookS) that you just can't put down! The Orb is finally safe in Riva and set back in the pommel of the great sword that hangs behind the Riven King's throne. While Belgarth is still recovering, Polara is concerned that the old man may have lost his Will and Word. (in other words: his powers). After only about a month's reprieve Garion reads the Mrin Codex and knows now what he must do. He alone must face Torak, the maimed faced God, and somehow kill him. But can a mortal kill a God? With this heavy on his mind he and Belgarath and Silk sneak out of Riva and begin their journey towards the inevitable. When things calm down Ce'Nedra begins to grow up. She takes charge of the armies beginning to gather to help Garion and Belgarath be able to reach Torak. The little Princess/ soon to be Queen, and Polgara leave with the kings and their building armies and head out to gather even more men in all the countries. After all, Torak is a God , and Garion needs a diversion in order to get to him. Will the little Queen succeed? Will the army provide the necessary diversion? Will Garion succeed in killing a God? These and other questions are answered in the last book of the Belgarian series, Enchanter's End Game. 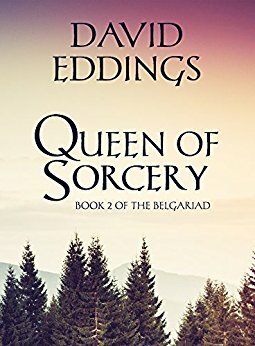 David Eddings has made such great characters to carry his story. There's not a one of them that you don't, sooner or later, feel as if you know them, or have met them before! In their journey's there seems to be nothing that you don't see or feel, and .. and.. (repeating myself ).. you really can't put the books down! The strength of the series is the development of the wonderful characters, the smooth plot and of course the dry humour. The God Aldur (Belgarath's master) summoned Belgarath and the others back to the Vale, where Belgarath's tower still stood. We get to meet Belgarath's twin brother's Beltira and Belkira and the ugly, misshapen, dwarf, Uncle Beldin; who remains dirty and unkept and in a way not understood by the companions, insults Polgara. In turn she throws insults back until the two hug in total laughter. "He is beautiful beneath the ugliness, she tells Ce'Nedra. Looks are not all that counts." During the time in the Vale, Belgarion begins to understand some of his power. But not without problems. From the Vale they journey to the land of Ulgo and meet with the Gorim beneath the mountain. The God Ul comes and commands one of his own, named Relg, to do Belgarath's bidding and help the company to steal the Orb back where it belongs. For safety reasons Ce'Nedra is left in the care of the Gorim while the others go in search of the Orb. Danger seems to come in many forms and in any direction they take as they continue towards Rak Cthol and the Orb and a battle between Belgarath and Ctuchik. All the while Belgarath continues to gather parts of the Prophecy around him. By the end of book three he believes he has all that he needs: the pure and innocent child that carries the Orb (Errand).. I can't remember when I have read 759 pages so quickly ! (Part II made up of just 2 books: The Castle of Wizardry & Enchanters End Game is nearly as long!) These books are so good and so exciting you just can't set them down!! And the characters! You just keep learning more and more about each of them, and every time you do you begin to feel that much closer to actually knowing them. You begin to worry, that maybe this time they won't get thru the problems they are facing. You begin to care. ... a dangerous thing to do when they are in such turmoil and danger! Belgarath, Polgara and Garion along with their friends, Durnik, Barak, and Silk pick up even more companions as they continue to search for the Orb and continue to believe in the Mrin Codex Prophecy. Lelldorin and Hettar and a Knight named Mandorallan join the company. Along the way they run into troubles (naturally) and worst of all they meet up with Chamdar, or rather the spirit of Chamdar, a nasty Grolim Priest, who doesn't intend very nice things on Belgarath's troop. Each time this Grolim's name is even mentioned Polgara wants to "take care of the problem". As they move through different territories they meet with the resident King , and Belgarath warns them of the impending trouble should the Orb reach it's destination of the damaged God Torak. During one such meeting we meet Ce'Nedra, a very spoiled princess, who runs away and winds up ... you guessed it.. with Belgarath. He is not pleased. But Polgara takes the girl under her wing letting her believe they will take her to her relatives the Dryads, but in truth, she has no intentions on letting this young lady out of her sight. on her 16th birthday she must present herself in Riva as a possible Queen. Ce'Nedra thinks not! Polgara knows better. heh. 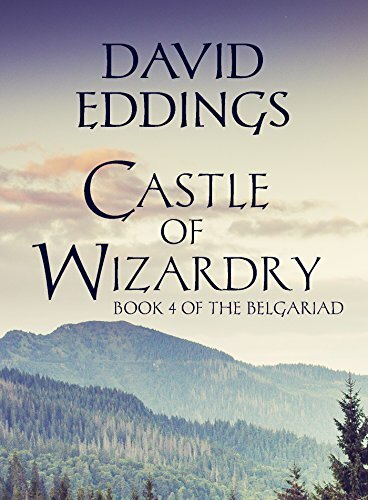 In this book Garion learns his real name is Belgarion and that he has powers. He's not a very happy fellow about it all, and wants nothing more than to be just a boy.. with no powers. Still following the trail towards the Orb the group splits up with Belgarath and Silk going one way and all the others go on a ship to Nyissa.. the land of the snake people, and their Queen Salmissra, who takes Garion and intends on keeping him to herself. This second book just gets better and better. The more that happens the more you have to keep reading to find out just how they get out of the latest mess or where they are going next!!! 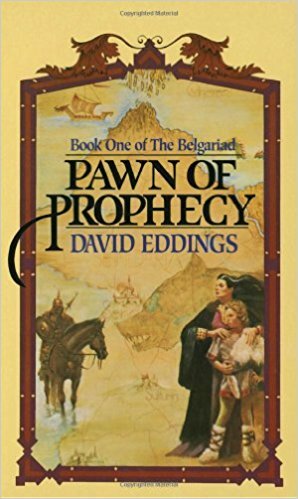 I love this book every bit as much as book I. Eddings not only makes great characters but along they way he reveals more and more about each the people in which this adventure is happening to... more and more you find yourself feeling like you know each and every one of them. CJ over at CJ Reading Seriously has tagged me with a non-fiction meme. Well.. most know I also enjoy collecting autographs. Now and then I get the bug to crochet afghans. And when I feel like it I enjoy drawing and writing. As for my reading non-fiction: I occasionally read Biographies and now and again I enjoy reading about our first astronauts from Gemini, Mercury and Apollo. I can't say I've read anything on collecting autographs, I can't really say I'd try to find one either. I've never read anything on crocheting with the exception of an actual pattern, and no I doubt I'd review any. I've read a few books on the Moon Shot and individuals that went to the moon, and when I read them I do make a small review. Only if I thought they would be interested. Have you ever fallen out of love with a favorite author? Was the last book you read by the author so bad, youbroke up with them and haven’t read their work since? Could they ever lure you back? It's strange but most every author I really like eventually goes off into a direction that holds no interest for me. But I am forever checking what they put out as new books. I am fiercely drawn to characters. If they grab me, chances are really good the whole book does the same. Of course a good story helps a lot, but the main character (or group of characters) has to hold me. I do realize for many writers they simply tire of writing about the same people or the same land etc (fantasy) and want to move on to something different. And sometimes, if I'm really lucky, eventually, they find their way back. (Stephen R Donaldson did this with the Thomas Covenant books) But I never truly leave authors I like... rather, I watch and wait... and hope... and if they endeavor to put out something new that sounds interesting I will try it to see if they can sweep me up once again. As I mentioned yesterday I am reading the Belgaraid series of 5 books. Although these books have been out for a long time there is a new version now in TPB. All 5 books are held in 2 trade paperbacks at 12.98 each. Much better price than buying 5 individual paperbacks! So... I finished book one : Pawn of Prophecy. In the first book, like many series, characters are introduced and a pattern is set as to what is to come. When it begins we find Aunt Pol taking care of Garion at the farm house. When he is nearly 14 things really begin to happen. The people he knows as Aunt Pol and the storyteller "the Old Wolf" he suspects, aren't who he thought they were. Things begin to happen in the lands that require Old Wolf's and Pol's help. Not willing to let Garion out of her sight they take him with them when they decided to leave the farm, along with Durnik the blacksmith, who seems to have an eye for Aunt Pol. All Garion seems to know is that he is no longer sure who he is or who Aunt Pol is or the storyteller. He surmises that they are searching for someone who sold something of large importance, but who and what he hasn't a clue. The great adventure that Garion thought he was going on quickly turns out to be not so much fun. Pol is determined to keep him under her thumb as a little boy, and Garion is bursting to begin to grow up. Meanwhile they meet up with some friends of Wolf's, a bear of a Cherek man from Val Alorn, named Barak and a weasel looking man named Silk, a known thief. Wars are a distinct possibility. And someone wants to kill Garion! Things escalate as all adventures do and you find yourself unable to stay away from the books for very long! I've quickly remembered why I love Belgarath, or maybe I should say, Old Wolf, who we find out is a sorcerer a few thousand years old. I think it is because I feel close to his age that attracts me ..heh. I am very glad that they have reissued this series of books into TPB since I really don't think these books should just quietly fade away. They've been around a good many years, and I suspect they are due for a whole new younger audience. I'm just not sure I want to share Belgarath! I'm going back to another series to reread!.. I don't think I've reread this series in something like 15 years! Hello?! Duh! I remember the basics of course, but I looked at these books the other day (trying to decide which series I would read next) and suddenly I found myself wondering. "Hmmm, " I said to myself. So I decided to reread this series to remind myself what it was about Belgarath that impressed me so much. I picked up the book yesterday and began to read. Not long after, in the endless noon of Garion's boyhood, the storyteller appeared once again at the gate of Faldor's farm. The storyteller, who seemed not to have a proper name as other men do, was a thoroughly disreputable old man. The knees of his hose were patched and his mismatched shoes were out a the toes. His long-sleeved woolen tunic was belted about the waist with a piece of rope, and his hood, a curious garment not normally worn in that part of Sendaria and one which Garion thought quite fine with its loosely fitting yoke covering shoulders, back and chest, was spotted and soiled with spilled food and drink. Only his full cloak seemed relatively new. The old storyteller's white hair was cropped quite close, as was his beard. His face was strong with a kind of angularity to it, and his features proved no clue to his background. He did not resemble Arend nor Cherek, Algar nor Drasnian, Rivan nor Tolnedran, but seemed rather to derive from some racial stock long since forgotten. His eyes were a deep and merry blue, forever young and forever full of mischief. This fascinating look at the now celebrated director tells of the inspiration that have led to the making of the three world-famous Lord of the Rings films - and the six other films that preceded them. 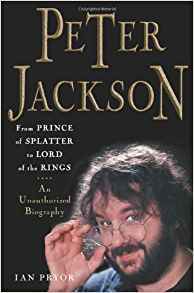 This unauthorized biography traces the journey of a young movie fanatic, from Sunday afternoons spent fooling around with a camera, through low-budget cult movies, to control of the most ambitious film project ever, on what is probably the best-loved fantasy novel ever written.This in-depth biography explores the many talents of the young Peter Jackson: the making of Bad Taste; Meet the Feebles; Braindead; Heavenly Creatures; Forgotten Silver; The Frighteners, and the Lord of the Rings trilogy. The story behind the Rings - which tells how Jackson got the rights to make the film and the permission and funding to make three films rather than collapsing the story into just one or two films, interviews, and other behind the scenes material from the making of the landmark films. Past and future - in which the author considers Jackson's achievements and possible future - including his remake of King Kong.From casts of zombies, traumatized puppets and murderous teenagers, to deal-making in Hollywood, this book is about following one's visions wherever they might lead. All I can say is: the review sounds better then it read. True, it talked briefly about his beginnings with his first small camera, and true it covered the movies he made before LOTR (those were the Splatter movies.. blood / gore etc) but to me it didn't really say a whole lot about the Man himself, and Mr Pryor dedicated way to much about the individual movies. It got to the point I began skimming for I knew I wasn't missing anything about Mr Jackson. Originally I had wanted the "big book" about Peter Jackson, but I just couldn't afford it. Now I would say to anyone wanting to read a Biography on him, that the book I got, isn't the best. Oh, it does give you some information on those first movies (too much) but if you want to know more of the Man himself, this might not be the book you want. 'Nuff said. It was ok but I've read better Biographies that's for sure! Meme: 10 signs that I wrote the book. Ok, that's it then... nothing earth shattering. Now I'm supposed to pick others to do this but I'll leave it up to you! Leave a link if you do it though so I can come by and read your 10 ! Bartimaeus is back, or, more accurately, he hasn't left in three years. While Bartimaeus is still witty as ever, his essence suffers severely from lack of rest. Nathaniel, spends his time writing propaganda so that the common folks belief that England is winning its foreign wars and tracking down traitors within the government. Excerpt from Bartimaeus: Times change. Once, long ago, I was second to none. I could whirl through the air on a wisp of cloud and churn up dust storms with my passing. I could slice through mountains, raise castles on pillars of glass, fell forests with a single breath. I carved temples from the sinews of the earth and led armies against the legions of the dead, so that the harpers of a dozen lands played music in my memory and the chroniclers of a dozen centuries scribbled down my exploits. yes! I was Bartimaeus... cheetah quick, strong as a bull elephant, deadly as a striking krait! And now... well, right now I was lying in the middle of a midnight road, flat on my back and getting flatter. Why? Because on top of me was an upturned building. Its weight bore down. Muscles strained, tendons popped; try as I might, I could not push free. In principle there's nothing shameful about struggling when a building falls upon you. I've had such problems before; it's part of the job description. But it does help if the edifice in question is glamorous and large. And in th is case, the fearsome construction that had been ripped from its foundations and hurled upon me from a great height was neither big nor sumptuous. It wasn't a temple wall or a granite obelisk. It wasn't the marbled roof of an emperor's palace. No. The object that was pinning me haplessly to the ground like a butterfly on a collector's tray, was of twentieth century origin and of very specific function. Oh, all right, it was a public lavatory. Quite sizable, mind, but even so I was glad no harpers or chroniclers happened to be passing. Kitty Jones has gone into hiding, apprenticing herself to a magician and learning enough from her master and through research to summon Bartimaeus herself. In this 3rd book you lean more about Bartimaeuss past and his connection to the boy whose likeness he wears. Kitty's strength and intelligence comes to light, and Nathaniel's long lost compassion emerges from the mask of John Mandrake. Ok.. I'm going to say it: I LOVED THIS TRILOGY! If I were Mr. Stroud I would write more books with Bartimaeus! But alas, he has gone on to something else that I just learned he is awaiting approval for publishing. I did however find another book by him that I will surely be ordering the next time I get books! Why, when it won't be Bartimaeus.. well.. he held my attention through 3 books! He made me not want to set them down! This can't be the only good story in this man! He instantly got pushed up near the top of my list of favorite YA authors..but more than that, he wrote something that adults can enjoy too! For anyone who was thinking about reading this series.. stop thinking and get the books! To those who like reading of wizards... go get these books! To anyone who enjoys insulting witty type humor... go get these books! You run the gambit with this series, from interesting, to laughter to exciting to an ending I never expected! If I had star ratings, this trilogy would get the highest amount of stars. Do yourself a favor, if you like anything I mentioned here, at least check them out at amazon . The other day Oprah did a show on overweight kids (and adults, but mostly how overweight the kids of today are). It isn't the first time this subject has been discussed, nor will it be the last. There are a few things that I've seen change over the years (I've got enough of those years to have seen much!) that never seem to be mentioned, and it drives me crazy! Both parents forced to work to be able to pay rents so fast food becomes a way of life. I could really get into this but it upsets me and makes me angry at the same time.. so I will leave it with just those few thoughts that I had that I never seem to hear mentioned when discussing overweight people.. especially kids. Two years have passed since the end of book one. In THE GOLEM'S EYE, young Nathaniel again finds himself in need of Bartimaeus, so he summons the reluctant djinni. This time, a revolutionary group is blowing things up in London, which may or may not be related to a series of other unusual occurrences that have been happening. Kitty, a girl of the resistance, who was introduced in book one by stealing from Nathaniel, becomes an import part of book 2. 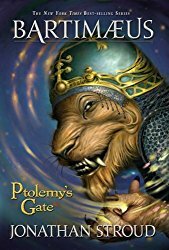 At first I think I was a little disappointed that Bartimaeus was not immediately in the story, but quickly I was pulled into the story of Kitty, the resistance, and a new "bad guy" on the scene in the form of a golem! Nathaniel feels that his career would take off if he can solve these crimes. But the stakes at risk are: his career, and possibly his life, if he fails. But such is the life of an up and coming magician. This is yet another good read!! As with a number of other YA authors that I have come across, Jonathan Stroud has come up with a very original and captivating story to tell. Not only does he have a djinni with a sense of humor (though Nathaniel would like to strangle him for it) but he has the knack of writing a story that holds your interest and keeps it moving at a pretty good clip, so that you want to keep reading to see what happens next! These books are turning into real keepers! Already I get a grin on my face whenever I look at them! Mr Stroud has certainly come up with one of those characters that will linger in your memory for some time to come! And I still have one more book to go! Yippee! Time flies.. here it is February 4th already! This morning, after having heard over the weekend that our temps for the week would be in the 40's and even into the 50's, I looked out my window and it was... snowing! So, I turn on the news and sure enough, it says it will turn into rain. This is weird! Never can I remember not having inches and inches of snow by now! Of course right a way I think of "global warming". You know, that thing they insist is "not happening"... heh, yeah right. Now, I know other areas have been hit hard by snow, and we have a way to go, even here, before winter is over. And I suspect we WILL get snow before winter is over. It's just not normal! Yes, we've had mild winters before. But never in my very long life, do I remember not having snow covered streets this far into winter. Part of me hopes this continues all winter (naturally) but another part wonders what it all means? I do know one thing.. I hope t'hell it isn't all waiting to happen the weekend of March 8th when I have a convention I am going to, and they don't allow you to get your money back for the tickets!! It can snow all it wants as long as the streets are clear and safe and no snow expected that weekend!! ... I guess we'll see how that goes. In the meantime I don't think I'll be building any snowmen! In the last few days I began to read the Bartimaeus Trilogy. Today I finished book I: The Amulet of Samarkand by Jonathan Stroud. Cover art by: Melvyn Grant. This is a YA book, but one any adult can enjoy.. I sure did! What a pleasant surprise this book was! Who can't like Wizards and djinni's? Especially, this Djinni! ...Bartimaeus! His sarcastic humor is impossible to go unnoticed and you find yourself smiling at his antics. At the age of five Nathaniel is sold to become an apprentice to a magician, Arthur Underwood. The story takes place in London where Magicians rule the land and where Nathaniel devours magical texts and hones his magic skills. At about age 11 Nathaniel is humiliated by a Wizard of some renown named, Lovelace, and Nathaniel vows revenge on the wizard. 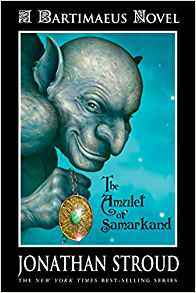 Some time later he conjures his first Djinni, who just happens to be Bartimaeus, who he asks to steal the Amulet of Samarkand from Lovelace, to begin his revenge against him. Although his age is against him, a really good adventure ensues, as Bartimaeus is forced to save his master time and again against the likes of Lovelace and horde of underworld creatures he has at his command. The book switches back and forth between first person (Bartimaeus) and third person in the reading, but it's done so well I found this to be no problem at all. I imagine it wasn't easy coming up with such a great personality as Mr. Stroud has done with Bartimaeus, but he's done a wonderful job! 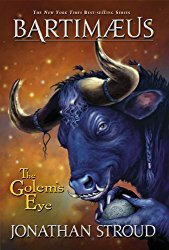 Now I am off to begin book II "The Golem's Eye"!